… I should have saved something from yesterday for today. Sure, I have more snow dog photos, but I’m saving those for Thursday. I have a finished object, but it is a sworn secret, so I can’t share that either. I can tell you what I’m thinking about knitting, while I crank out crochet scrubbies. THIS, in Wool-ease, in a kinda’ natural color, with a heathered blue trim. Maybe this or some other chunky-weight sweater for Gretchen, since it’s so very cold still. 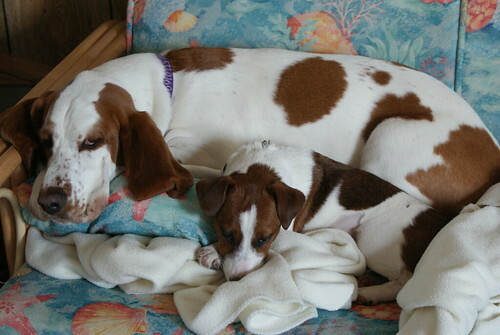 Just because I can’t stand to give you a photoless post… The girls, snuggled up after a cold potty break at the beach. How was your weekend, since I’m just settling into my weekly routine? This entry was posted in Gretchen, Sissy. LOVE how your girls cuddle up. For being so different, I love how much they look alike. Going right now to follow those links and see what you’re up to. I’m trying to get some things off the needles so I can CO some new socks. They sure do look a lot alike! Thor had a happy weekend, because one of his kids came home for the week (spring break). The kid ain’t too happy, because he had a “bumper bender” and busted up the grill on his Dodge Ram. So now he has to work around the house for a couple of days to pay for the parts, and figure out how to install them by himself! Be glad you don’t let Sissy and Gretchen drive! Look at the cuddles:) They are just adorable, Chan. Gretchen loves her big sis! Or, should I say her big Sissy!?! Awww, they are so adorable! You can sure tell they love each other! Awww, they are sooooo cute! I just love those two all snuggled up together. What a joy they are. There are four of us here right now, and when I turned the computer screen out so that they could see, everyone just went “awww” at the sight of your cute babies. Yeah! For MMMmmalbrigo March! Just love the snuggling photo! I like that red cap. Where is the pattern for that? The girls look so cozy all curled up together. I love seeing pics of the pups! great photo. i love the hat! it would be fabulous in pink. Lots of secret knits, eh? That hat is very cool… love the girls pic! That is one of the best photos I’ve seen on your blog yet! Just fantastic. Can’t wait to see your Capitan in the Mal chunky!! Yum! !